The two-part Will Graham Celebration of Love kicked off Tuesday in southern Thailand and continues this weekend. Will Graham has preached in the country a few times before. In the mostly Buddhist nation of Thailand, some might assume there’s little room for God’s Word to spread. “There are very few Christians and very few churches,” explains Mark Roberts, resident Celebration director for the Billy Graham Evangelistic Association (BGEA). But that doesn’t equate to a lack of fervor and passion from Thailand’s Christ followers. As Will Graham preaches at the Celebration of Love in Thailand, Roberts says there’s a “real excitement” about what’s taking place. Two events are happening this week to share the Gospel in southern Thailand: one in Surat Thani, which occurred Tuesday and Wednesday, and another one this weekend in Phuket, which kicked off Friday. The Celebrations are BGEA’s final evangelistic events of 2018, followed by Franklin Graham returning to Thailand in January 2019 to preach the Good News in Bangkok. “Many senior church leaders realize this is a really historic time for Thailand,” Roberts said. 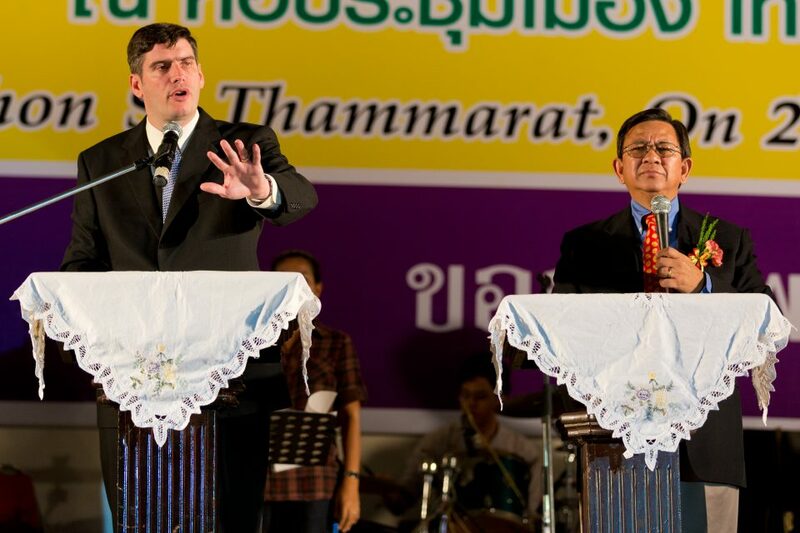 Will Graham held his first Thailand Celebration in 2010, visiting Chiang Rai, where 16,000 people came to hear him preach the Gospel. Two years later, Will returned to Nakhon Si Thammarat (pictured above) and then to Udon Thani in 2013. The Celebration of Love has been a few years in the making. Roberts first started meeting with pastors in 2016, but planning was halted as the country mourned the death of King Bhumibol Adulyadej, Thailand’s longest-serving monarch. Although the Celebration was postponed, God didn’t stop working. “Things kept spreading and as it spread, enthusiasm grew,” Roberts said. The local team held kickoff events across southern Thailand to get the word out. “Everywhere we went, different pastors would say the same thing: ‘We’ve never seen anything like this before,'” Roberts said. Now, there are upwards of 250 churches involved in the Celebration and thousands of Operation Andrew cards have been distributed. The evangelism tool developed by BGEA helps Christians identify and pray for people around them who need Christ. 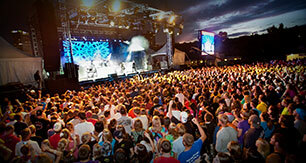 Because churches stayed engaged even while the Celebration was delayed, “A lot of people were accepting Christ” before a new date and other details were finalized, Roberts said. “Every time I see weary wanderers fall to their knees with tears streaming down their faces, crying out to Jesus for forgiveness and the hope of eternity, I see that which was once dead made alive again in Christ Jesus,” Will Graham recently said in a prayer letter to supporters. This photo is from his event in Nakhon Si Thammarat, Thailand. With Christians representing only a little over 1 percent of the population, churches have their work cut out for them. They’ll need your prayers as they disciple new believers that may come their way as a result of the Celebration. “It’s challenging for people to leave [Buddhism and other practices] behind, but most just don’t know anything about Christianity,” Roberts said. People are also facing real issues that present a need for the hope of Christ, especially economically. “Poverty is something every church has to deal with,” Roberts said. “Many people find themselves stuck” while trying to find new job opportunities but falling short. 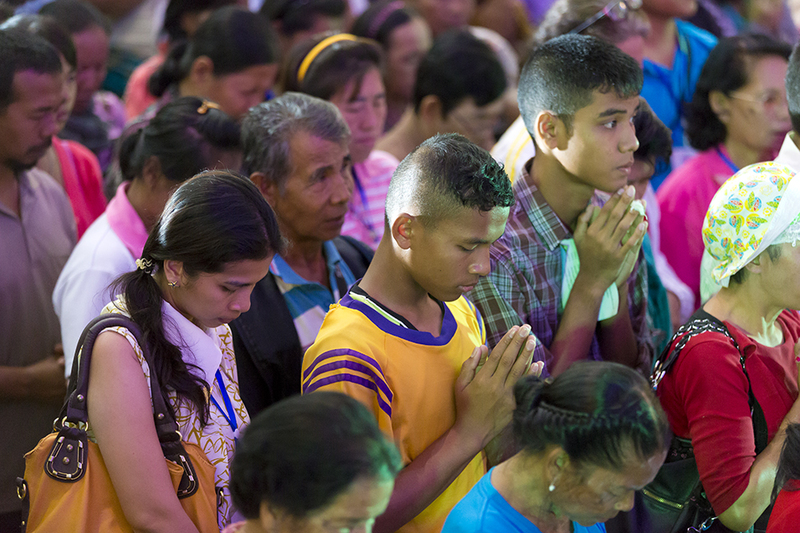 Still, God’s work is evident, and Thailand’s Christians are hopeful. Pray that hearts will be open to the Gospel message as many people hear about Christ’s love for first time. Pray for Christians across southern Thailand to have boldness to invite those who don’t know Christ to the Celebration. 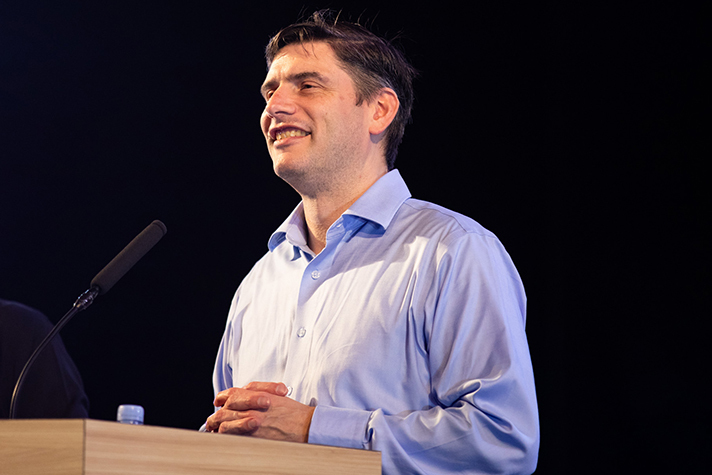 Pray for Will Graham as he shares the Gospel and for the BGEA team at the event.